Juventus went six points clear at the top of Serie A as they bounced back from their controversial Champions League exit to Real Madrid with victory over Sampdoria. Douglas Costa, a 43rd-minute substitute, assisted all three goals. 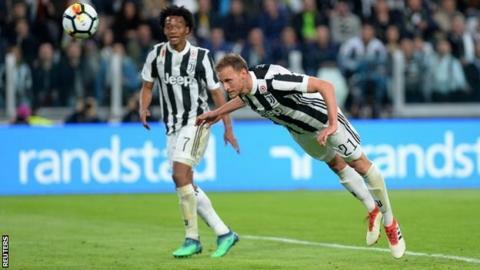 Mario Mandzukic slammed home Costa's cross at the end of the first half and Benedikt Howedes headed in his first Juve goal from another centre. Costa then found Sami Khedira to guide home a third goal. Juve, who have dropped only four points since 19 November, host Napoli next Sunday at 19:45 BST. The Turin side, chasing a seventh consecutive league title, lost to an injury-time Cristiano Ronaldo penalty on Wednesday after coming back from 3-0 down in the two-legged tie. Goalkeeper Gianluigi Buffon, who was sent off for dissent against Real and gave several angry interviews after the game, pulled off a good save to deny Sampdoria's Duvan Zapata late on. Napoli, who topped the table for much of the season, lost further ground in the title race as they were held to a 0-0 draw by AC Milan earlier on Sunday. They almost won it late on when Arkadiusz Milik's close-range shot was brilliantly saved by Gianluigi Donnarumma, making his 100th Serie A appearance at the age of 19. Champions League semi-finalists Roma drew 0-0 with Lazio in the capital derby. Lazio had Stefan Radu sent off for two bookings with 10 minutes left and Edin Dzeko had three chances to win it for Roma, including a header which hit the crossbar. Match ends, Juventus 3, Sampdoria 0. Second Half ends, Juventus 3, Sampdoria 0. Attempt saved. Duván Zapata (Sampdoria) left footed shot from the left side of the six yard box is saved in the centre of the goal. Assisted by Dennis Praet. Attempt missed. Douglas Costa (Juventus) right footed shot from outside the box is close, but misses to the left. Assisted by Juan Cuadrado. Offside, Juventus. Stefano Sturaro tries a through ball, but Daniele Rugani is caught offside. Attempt saved. Juan Cuadrado (Juventus) right footed shot from outside the box is saved in the centre of the goal. Assisted by Douglas Costa. Corner, Juventus. Conceded by Valerio Verre. Corner, Sampdoria. Conceded by Kwadwo Asamoah. Substitution, Sampdoria. Valerio Verre replaces Edgar Barreto. Substitution, Juventus. Stefano Sturaro replaces Sami Khedira. Offside, Juventus. Mario Mandzukic tries a through ball, but Blaise Matuidi is caught offside. Corner, Juventus. Conceded by Vasco Regini. Goal! Juventus 3, Sampdoria 0. Sami Khedira (Juventus) right footed shot from the centre of the box to the bottom left corner. Assisted by Douglas Costa. Corner, Sampdoria. Conceded by Rodrigo Bentancur. Corner, Sampdoria. Conceded by Benedikt Höwedes. Substitution, Juventus. Rodrigo Bentancur replaces Paulo Dybala. Attempt missed. Dawid Kownacki (Sampdoria) header from the left side of the six yard box is too high. Assisted by Lucas Torreira with a cross following a corner. Corner, Sampdoria. Conceded by Daniele Rugani. Foul by Gianluca Caprari (Sampdoria). Substitution, Sampdoria. Gianluca Caprari replaces Gastón Ramírez. Goal! Juventus 2, Sampdoria 0. Benedikt Höwedes (Juventus) header from very close range to the bottom left corner. Assisted by Douglas Costa with a cross. Attempt blocked. Sami Khedira (Juventus) header from the centre of the box is blocked. Assisted by Benedikt Höwedes with a cross. Attempt saved. Duván Zapata (Sampdoria) header from the centre of the box is saved in the top centre of the goal. Assisted by Vasco Regini with a cross. Lucas Torreira (Sampdoria) wins a free kick in the attacking half. Edgar Barreto (Sampdoria) wins a free kick in the defensive half. Benedikt Höwedes (Juventus) is shown the yellow card for a bad foul. Foul by Benedikt Höwedes (Juventus). Duván Zapata (Sampdoria) wins a free kick in the defensive half. Delay in match Lucas Torreira (Sampdoria) because of an injury. Attempt blocked. Paulo Dybala (Juventus) left footed shot from outside the box is blocked. Assisted by Juan Cuadrado. Attempt missed. Douglas Costa (Juventus) left footed shot from the left side of the box is too high. Assisted by Mario Mandzukic. Attempt missed. Gastón Ramírez (Sampdoria) right footed shot from the centre of the box misses to the left. Assisted by Dawid Kownacki.